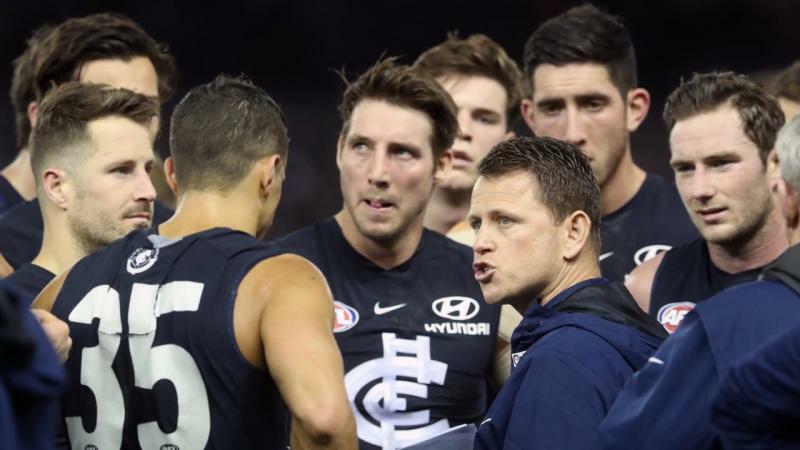 Carlton chief executive Cain Liddle has declared coach Brendon Bolton is safe in his job after the troubled Blues slumped to another demoralising AFL loss. It may be a different story come season's end however, with Bolton sitting precariously after his side's two-point loss to Gold Coast. Sunday's defeat to a Suns side that has defied expectations to win three of their first four games was crushing for several reasons. Carlton is now the only team yet to record a win this season, puncturing hopes of a rebound from last season's wooden-spoon finish. While Gold Coast, St Kilda and Brisbane have all made clear leaps forward after bottom-four finishes in 2018, the Blues appear to have stagnated. And Bolton, who has led Carlton to 15 wins and 55 losses, is firmly under the gun considering the number of recent high draft picks at his disposal. Bolton looked devastated while being consoled by Blues chief Liddle in the Carlton rooms after the game at Metricon Stadium. "Someone I care about was hurting, as was I, and we were consoling each other," Liddle told reporters at Princes Park on Monday. "At times like this, good clubs stick together and as far as I'm concerned, that's exactly what we're going to do." Bolton is thought to have strong support from president Mark LoGiudice, meaning any move on his job is unlikely any time soon. But the former Hawthorn assistant is unlikely to survive beyond this season unless the Blues can put their horror start behind them and begin chalking up wins. Carlton face the Western Bulldogs at Marvel Stadium on Sunday and Liddle said the entire club was under pressure to deliver its first win for the season. "This is not about Brendon. This is about all of us," he said. "We're one big club. There's a lot of us that are under pressure and ultimately that doesn't rely on one person, that's a whole club thing and we'll keep fighting it as a club."